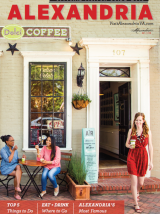 With the new self-guided walking tour, visitors can explore Alexandria&apos;s rich beer history while sampling brews at a choice of 15 pubs and restaurants along the way. Pick up Alexandria&apos;s Historic Breweries: A Walking Tour & Pub Guide at the Alexandria Visitors Center at 221 King Street and at participating pubs and restaurants (listed below). The map will guide you through a comprehensive history of brewing in Alexandria, while designated "Hops Stops" highlight top places to pause for a brew or snack. Hops Stops are denoted by . Physical sites are denoted by markers. Use the hashtag #ALXBrewTour as you share photos of your tour experience on Instagram, Twitter and Facebook. As always, please drink responsibly. Hop on and off the free King Street Trolley, which runs from the King St-Old Town Metrorail station to the waterfront seven days a week. See DashBus.com/Trolley for schedule. Established in 1749, this bustling port town brimmed with Scottish merchants and Irish immigrants. Because public drinking water didn&apos;t yet exist, people quenched their thirst with beer, a staple of 18th-century life and the preferred beverage of dockworkers, shipwrights, sailors and families alike. Alexandria was home to the largest pre-Prohibition brewery in the south, and one of the most historically relevant breweries in U.S. history, the Robert Portner Brewing Company. Also known as the Tivoli Brewery, which brewed from 1862-1916, the Robert Portner Brewing Company closed when Virginia passed the 18th Amendment and Prohibition ensued. Only in 2011 would production brewing return to Alexandria, with the arrival of Port City Brewing Company.